This 6-hour class runs on Mondays with a one-hour break for lunch. Curious about weaving? Want to try it out without delving too deeply? Not sure if you'll like it (even if it does use up stash?) Then this is your class! When you sign up for the class you will pick two colors to work with that are high contrast. (See MATERIALS NEEDED below.) You will need a minimum of 250 yards for each color. Leave it at the shop and we’ll wind the yarn and then warp the loom that you’ll be weaving on. That way it will be already to go when you arrive in class! 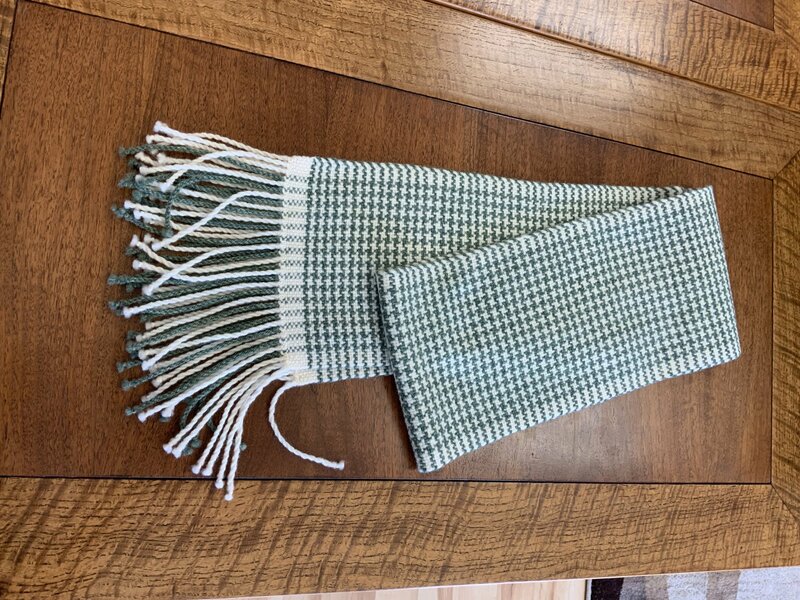 In this 4 hour class we’ll teach you about the rigid heddle loom and get you started on weaving. By the end of the class you will have a completed herringbone scarf and a better understanding of the weaving process. Ashford rigid heddle looms are available for use in store during the class. Looms are also available for purchase. If you come away interested then the next step is Weaving 101. - Homework: YES - pick out yarn and bring it in at least 2 days before class so we can get the loom set up. See below for recommendations. Skill Level: Novice - No experience necessary. You will need 2 colors of worsted weight wool yarn—at least 220 yards each. We suggest Shepherd’s Wool, or Cascade 220. The sample uses Shepherd's wool and is slightly felted. The Cascade 220 is superwash and will not felt in the same way but will still fill in nicely. These need to be bought or brought in several days before the class so we can warp the loom. At least 2 days before the class, but earlier is appreciated. Materials Provided: Use of a rigid heddle loom and associated tools and accessories Bring a notebook, pencil/pen and any glasses needed for close work. Standard knitting supplies: Yarn needle, scissors. Materials Included: The use of the loom and weaving tools and accessories during the class.